Everyone desires shelter from the storms of life. Adults and children alike seek refuge where acceptance and peace abound. Considering the fallen world we live in, how is this safe haven attainable? Using sound Biblical principles, A Safe Harbor presents firmly established truths. When applied, these truths will change your life and the life of your family. 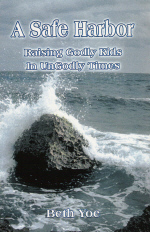 In an age where families are falling apart, we need a wake up call to the truth of God's word. God's ways are perfect. He has given us His plan for our good and for the good of our families. We need only heed His instruction.